You brush your teeth twice a day, every day, but did you know that not all oral hygiene products are created equal? From toothbrushes to mouthrinses and everything in between, the numerous options can be overwhelming. So, where do you start when looking for the best products for your smile? With this post from the team at Smiley Family Dentistry! They share tips on how to care for your teeth in between the times you have a professional dental cleaning in Waverly with them. As your premier dentist in Waverly, Dr. Jonathan Waverly always recommends toothpastes with fluoride in them – this natural mineral helps remineralize your enamel and protect against cavities and tooth decay. Stannous Fluoride is great, since it’s a natural antibacterial substance and prevents gum disease. It’s better to opt for a product with this in it rather than one with Triclosan, an antibacterial agent that the FDA has seen fit to remove from hand soap, but not toothpaste. Look for products with the American Dental Association (ADA) seal of approval, and talk with our team if you have special smile needs, like sensitive teeth. Pastes, gels, and different flavors all work well, as long fluoride is present. You should definitely choose a toothbrush with soft-bristles, no matter your age or dental needs – medium and firm bristles don’t provide any extra benefits, and can actually lead to gum recession. 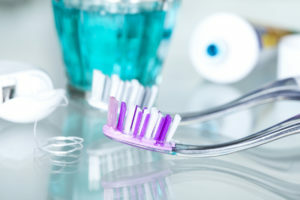 Electric toothbrushes can be helpful, especially for elders with arthritis who might have trouble holding a manual toothbrush, or for people who have a tendency to brush too hard. For sizing, try to find one that touches 1-2 teeth at a time – youngsters will need a very small brush. Always opt for a floss that’s waxed, since this extra layer of lubrication allows the product to slide in between teeth with ease. Satin-style floss is excellent and works well to make flossing comfortable. Flavors or flavorless are both fine, but ultimately, the best type of floss is the one you actually use. Mouthrinses can be a vital part of your oral hygiene routine. Again, look for products with the ADA seal of approval, and try to find one that includes fluoride and that’s antibacterial to ward off gum disease. Alcohol-based options can be a bit of a double-edged sword – although they kill bacteria, they can cause dry mouth, which actually increases the amount germs in your mouth. And, kids under 6 shouldn’t use mouthwash with this ingredient, since they’re likely to swallow the liquid. Talk with Dr. Smiley about the options that are right for you. Taking care of your teeth at home is essential to keeping your smile healthy, so use these tips to make the most of your oral hygiene routine. And remember to schedule an appointment with Smile Family Dentistry every six months, since there’s no substitute from high-quality, professional dental care to keep your pearly whites gleaming!